Do not be surprised. Be Vigilant!! May the Words of my Mouth and the Meditations of my heart be acceptable in your sight, Oh Lord and my strength and redeemer. This was a challenging week as many people I talked with were dealing with the tragic events that happened in Charlottesville, VA and the political, social and cultural aftermath. It’s been difficult, and the words I heard often were, I am not surprised. Whether in conversation, listening to the radio, or just at the local CVS, those words ring in my ears, like clinging symbols. The words, “I am not surprised”, for many, like my family, represent an historical marker. They remember the years of Jim Crow, segregation, red lining, discrimination, etc., too many issues of injustice to name here. Many people, like my mother, said, “I am not surprised” because they knew there would be a response from those who embrace white supremacy, white nationalism, Neo-Nazi’s, and the Klan, to a country which elected its first African American President twice, and a nation becoming more and more multicultural. 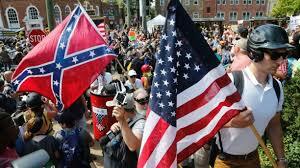 According to the Southern Poverty Law Center there has been a 755 percent increase in hate groups since 2008. Nell Irvin Painter, the emeritus, Edwards Professor of American History at Princeton, and the author of "The History of White People", writes, in an Article in the New York Times, that there is an American tradition of call and response. The call: a challenge to the status quo of white-people-on-top; the response: outbreaks of meanness, many merely vile, embracing rhetorical weapons, many murderous, taking up physical weapons. The bloody history of lynching, with its festive mobs and souvenir post cards and body parts, bristles with personal provocations to the racial status quo. So, although the current occupant of the White House reveals day by day, and sometimes, moment by moment, how unfit he is, he is the one most suited to answer this call. In the 19th-century, the Ku Klux Klan arose in the South as a response to black citizenship. Federal action put it down, but in the 1920s, a resurgent Klan added immigrants, Catholics and unruly women to its black targets. In the West, official massacres and the "Driving Out" of the late 1800s had already ethnically cleansed Native Americans and run off Chinese workers and business people. Considering this uniquely American Call and Response, Progressive Social Movements such as the Abolition movement, the Suffrage and Women’s Rights Movement, the Civil Rights movement, and movements for economic justice, have historically been and still are today a means to form a more perfect union, to address the call and response, as a means to move the country forward for all people. To help the country, as Rev. Dr. Martin Luther King, Jr., said, in his “I have a Dream Speech”, to live out its promise that all men, yes, black men as well as white men, would be guaranteed the unalienable rights of life, liberty, and the pursuit of happiness. The words of Dr. King call us to rise and not be silent in the face of the complex and at times ugly history of America. His words call us to live out the calling of Jesus Christ, and, even with the complexity and complications of issues, made visible once again in Charlottesville, to overcome the politics of fear, hatred, bigotry and racial fragility, terrorisms, which have maintained structures of racial, economic, and cultural oppression, which have consumed this nation for two and a half centuries. The protest at Charlottesville, was a clash not only about statues and monuments to a lost cause of 156 years ago, but a clash of narratives, between those like the KKK, people of faith , including clergy, who stand for an empire of racial hierarchy, and organizations and people which stand for social justice, including clergy and people of faith, who represent emerging structures of power, which put the empire of racial hierarchy and its various illusional interests like privilege at risk. Those of us who stand on the side of social justice must realize, and this is important to say, that Charlottesville was the stand of the foot soldier. While they were there and made their stand the greater risk are concerns regarding political policies of voter suppression, a reemerging discrimination based on religious preference, healthcare policies continually under attack, and, according to an article written by Alan Singer in the Huffington Post, a public education system initially created for the public good more and more at risk of becoming privatized for corporate interests put forth by political forces which seek to maintain a narrative gradually receding like empires of the past. Simone Weil, a French philosopher, political activist and mystic who lived in the early twentieth century, amidst the horrors of WWII, writes in her book “Waiting on God”, Attention is the rarest and purest form of Generosity.” Considering Simone Weil’s words of wisdom, giving attention to this historical transitional moment in the life of America, on display last weekend in Charlottesville, we are called to open our hearts to what might be called a peculiar grace. Peculiar grace, according to Aaron Tiger, Pastor of Trinity UMC in Muldrow, OK, is the sharing of the immense grace of God through extravagant and creative means. The underlying value of peculiar grace, according to Pastor Aaron Tiger, is the worth of the other. Every encounter with another is an opportunity to convey grace to a child of God. This radical view of persons prompts us to show radical grace to the other. Peculiar grace is not what German pastor, martyr, prophet, and spy Dietrich Bonhoeffer called cheap grace. It is not an enabling grace, so that we give people addicted to white supremacy and other illicit drugs, as described by Carol Anderson, chair of Emory’s Department of African American Studies, in an article in the Guardian entitled, “America is still hooked on White Supremacy” some type of pass, but peculiar grace stands in the truth found in the life, death and resurrection of Jesus Christ, it reflects the mystical dimensions of love, described by the Apostle Paul in 1 Corinthians chapter 13, the love chapter. In the light of peculiar grace each of us should give attention as a form of generosity to those who are fearful of change. To engage family members, friends and folks who might think differently, from a theological perspective, about race, racism, and multiculturalism, to share a different perspective rooted in love. Beloved of Christ, we’ve trod this road before, this is nothing new and we will navigate in such a way as to overcome these struggles to enter a new and everlasting hope in Christ. The words of 1st Peter 4:12-17 say, “Dear friends, do not be surprised at the fiery ordeal that has come on you to test you, as though something strange were happening to you. But rejoice, since you participate in the sufferings of Christ, so that you may be overjoyed when his glory is revealed. If you are insulted because of the name of Christ, you are blessed, for the Spirit of glory and of God rests on you. If you suffer, it should not be as a murderer or thief or any other kind of criminal, or even as a meddler. However, if you suffer as a Christian, do not be ashamed, but praise God that you bear that name. For it is time for judgment to begin with God’s household; and if it begins with us, what will the outcome be for those who do not obey the gospel of God? And, “If it is hard for the righteous to be saved, what will become of the ungodly and the sinner? So then, those who suffer according to God’s will should commit themselves to their faithful Creator and continue to do good.” Peter is encouraging the early Christians in regard to strive in the community of faith, a reality of the human condition (1) Not to be Surprised (2) Trust in God, Be the Christ and (3) Be Vigilant and always ready amidst events ungodly and unjust. The other day I was asked by a student, “How do we engage someone who has very different views on issues of social justice and are profoundly faithful to those views?” I said, to be clear there are people of faith who have strong opinions on very complicated and complex historical issues. What we must do in this historical moment is to be the Christ, to be the compassion, to sooth the fears of those unable to express that fear in ways helpful. To do good, worthy and Christlike acts which seek to heal the wounds of a diverse and teaming humanity. In the final analysis, it is the heart that God examines not so much the action, or inaction or theological concerns, in this the hope is found. In closing, I am reminded of the words of Theodore Parker, A Unitarian Universalist Minister who lived from 1810 to 1860, who said, “The arc of the moral universe is long, but it bends towards justice.” The issues raised in Charlottesville would seem to be the latest example of the profound wisdom of this statement. It has been a long struggle, yet with the peculiar grace of God this nation and its people will continue to live into its founding creed that all people are created equal, that they are endowed by their Creator with certain unalienable Rights, that among these are Life, Liberty and the pursuit of Happiness.